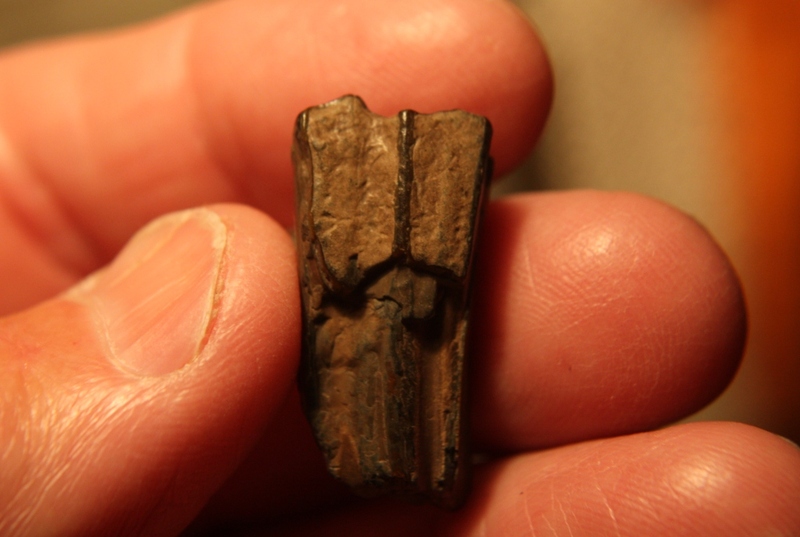 I have found three toed horse teeth before, but most of them had isolated protocones. This one does not. It measures 11mmx12mmx24mm and while chipped seems to be all there. Hopefully, the squiggly shape on the occusal surface is diagnostic. The term "three toed horse" is not necessarily applicable to all ancient horses before the equus. I have several charts showing the evolution of the horse. 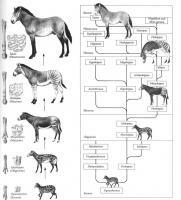 If these charts are correct the last of the true three toed horses lived during the late Micocene era, the protohippus. I read an article in which the author theorized most horse fossils found in Florida post date the Micocene era. 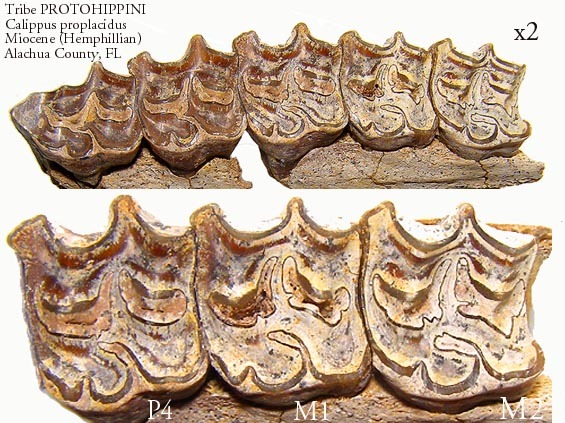 However, an exception the parahippus, a Miocene horse, is found in Florida? 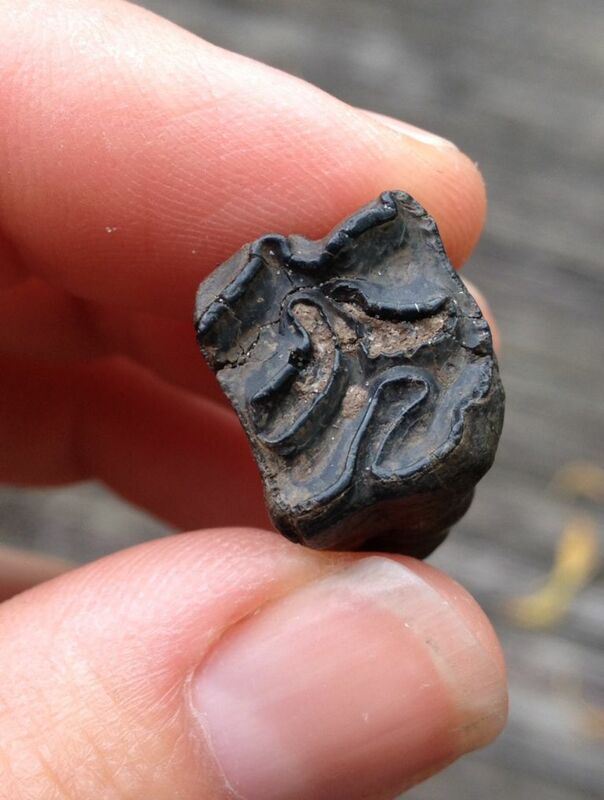 I have a big box of fossil horse teeth from all over the country which I've studied very carefully. 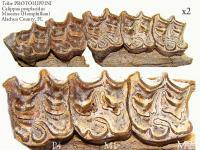 No expert but not all early fossil horse teeth show the independent protocone. Wear affects the appearance of the enamel ridges. Even in the early horses, like the parahippus with crested molars, when worn they assumed a pattern similar to later horses with a flat surface. I'll take a chance and date the molar to the Pliocene, one of the early horses to walk on a single hoof before the equus. A transitional species. In North America, a few species of three-toed horses (one of Cormohipparion or Pseudhipparion perhaps and certainly at least one species of Nannipus) survived into the Pliocene. In Africa, at least one genus survived into the Pleistocene. Parahippus lived during the Early Miocene - found with Archaeohippus remains as well. It is known from a few Florida sites such as Thomas Farm. In the Bone Valley Formation a good diversity of genera and species have been studied. The University of Florida has a large collection of them. In the Late Miocene layers you can find Cormohipparion, Neohipparion, Pseudhipparion, and Nannipus. 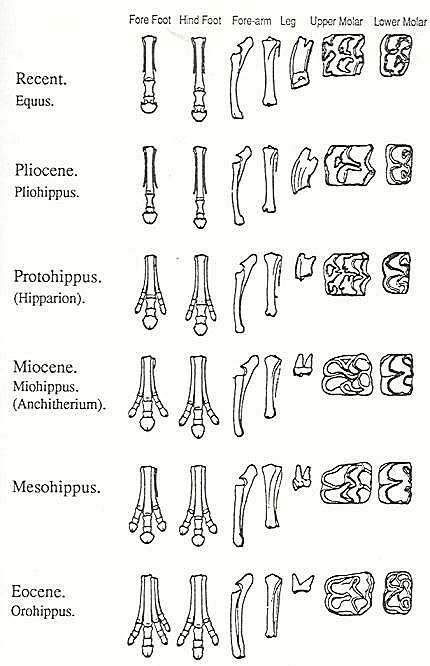 I think other Bone Valley horses, Astrohippus and maybe Calippus, are also considered three-toed forms. See attached chart. Depends on what a person calls "three toed". I think that the Pliocene marked the end of stripe-rumped horses. "Three-toed" is short-hand, not to be taken too literally. Even modern Equus has traces of the three toes. Thanks to all who replied with comments and guidance. As Harry indicates, I was (maybe incorrectly) using the term to refer to a horse that predates Equus with the hope that someone might be able to identify to a specific horse. 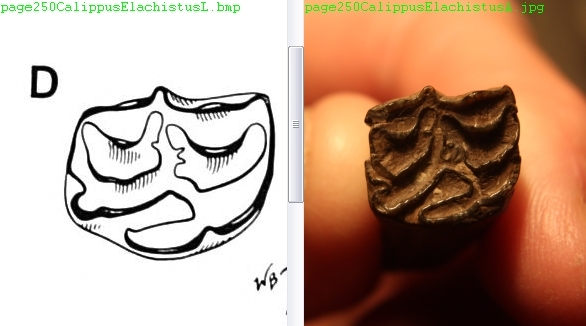 I would be really pleased if it turns out to also not be three-toed, but some other pliocene horse. When Miatria (who hunts the same location where I found this tooth) and sent the following photo that seems remarkably similar to my photo above. This is also a complete tooth. 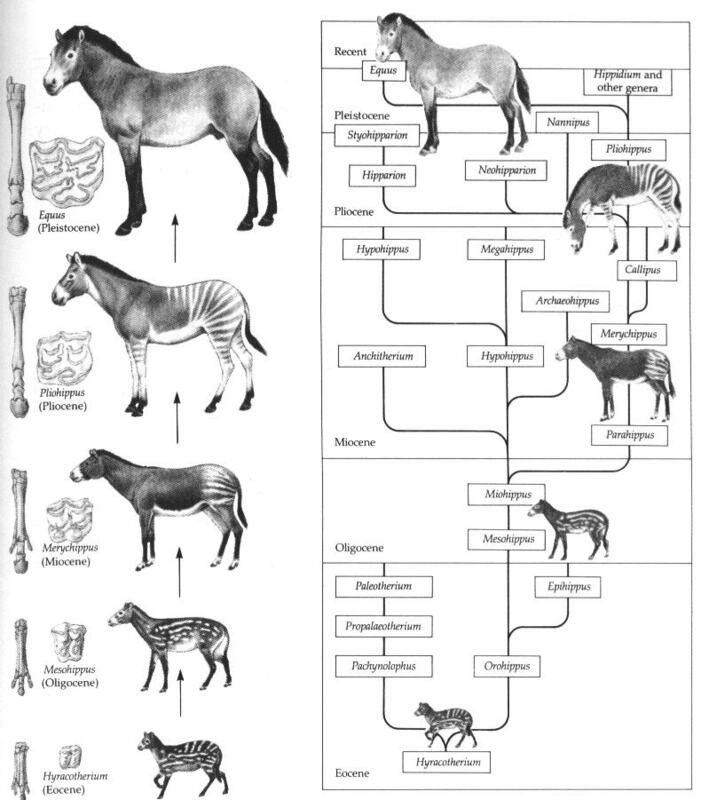 That is an out-dated chart since it does not include Dinohippus as close to if not ancestral to Equus. The "Hyracotherium" position has more recently been interpreted as more complicated than indicated as well. The Dinohippus-Equus connection is discussed in "The Fossil Vertebrates of Florida" (Hulbert, editor, 2001) but in more detail in "Fossil Treasures of the Anza-Borrego Desert" (Jefferson and Lindsay, eds. 2006). While these books appear to be of primarily regional interest, they contain information that applies to forms known across North America and to some extent Central America. Anyone interested in fossil horses, or Cenozoic mammals in general, should have both these books. 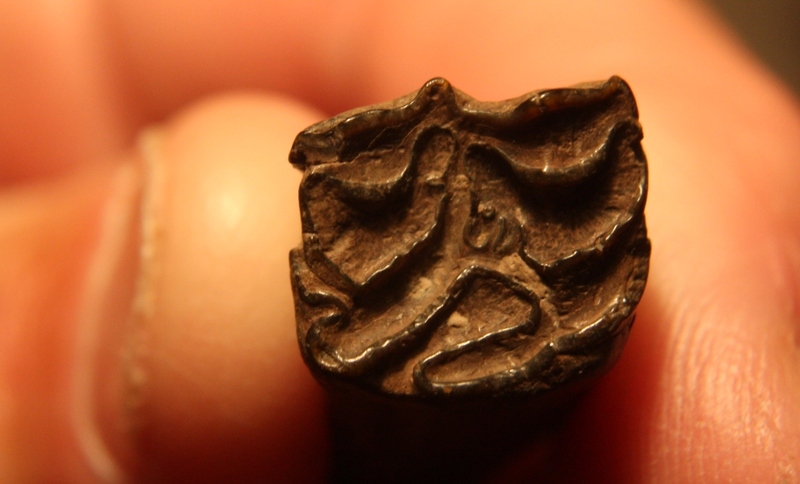 I have understood "three-toed" to refer to horses that normally exhibited three external toes on each of the four limbs and that would include most fossil genera. That doesn't count genera which usually exhibit discernible side splints rather than actual toes as in Onohippidium. Every once in a while, a modern Equus individual is born with actual side toes reflecting its ancestry but that wouldn't qualify it as a three-toed horse. Dinohippus, Onohippidium, Hippidion, and Equus would be considered one-toed horses. I'm not sure about Astrohippus and Pliohippus though the latter has been used as a "wastebasket taxon" in the past. Some species once assigned to it have been placed in other genera including Dinohippus.. Thank you for the clarification, Siteseer. Perhaps I could have said, 'three-toed horse' is not a taxon in the phylogeny of horses. Nor does the fact of three toes seem to be a significant morphological feature. I found no reference to 'three-toed horse' when I reviewed Hulbert's account of Florida horses. Bruce MacFadden leads off his 1984 monograph on hipparionine horses with, "During the Miocene and Pliocene the three-toed hipparion horses were a geographically and temporally widespread element of terrestrial mammalian faunas throughout North America and the Old World." Then he spends 190 more pages describing skull and tooth characters of these horses without reference to three toes. How do Jefferson & Lindsay treat the three-toed horses, Siteseer? External toes on these early horses seem to be a matter of morphological detail, when the important characters seem to be in the skull and teeth. Certainly, most collectors know these various horses only by the teeth or by phylogeny charts published in the popular press. "Three toed horse" seems to be more of a popular meme than a scientific descriptor, embracing the most memorable piece of trivia about the evolution of horses. The book covers fossils of the Anza-Borrego area going back seven million years back when the Gulf of California extended into what is now California almost as far north as Riverside. Hipparion horses were extinct in the region by the time the sea retreated. I think it's a book you should check out. 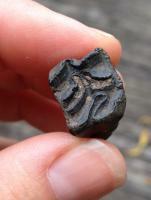 Some nice photos of fossils - California versions of some of the animals you've seen from Florida sites. UF might have a copy at the Marston Library. By the way, welcome back after a noticeable absence. 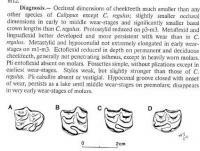 Using the link above, I looked at a large number of cheek teeth that were identified as specific horses in the Calippus family. 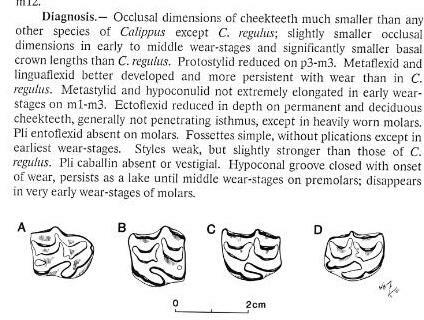 The closest match to the tooth I found in both size and details of the occusal surface was a lower right M1 or M2 identified as "D" in the picture below (Taken from page 250), While not definitive this would seem to be a close relation to Calippus Elachistus. and I learned some things by reading a 30 year old paper. If there is a closer match I would like to see it, I'm glad you could track down an ID.